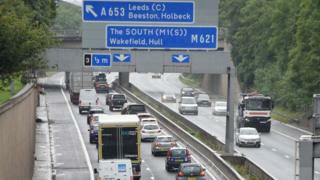 Detailed plans for redevelopment of the M621 have been released ahead of a public consultation. Highways England wants to cut congestion on the eight-mile stretch of motorway, which links the M1 and M62 with central Leeds. Among the proposed changes are plans to convert parts of the hard shoulder between junctions one and three to add extra lanes, and to close junction 2A. The redevelopment is part of a £1.3bn programme of work announced in 2015. A Highways England spokesperson said: "The M621 is a vital link between Leeds city centre and the surrounding road network. "It's already very congested, especially at peak times [and] this congestion will only get worse with economic growth expected in the region. "That's why investment is needed to provide more reliable journeys for people using the route." Three redevelopment plans have been put forward - A, B and C.
Options B and C include all the changes proposed under option A plus additional alterations. A public consultation on the plans is due to run from 4 September to 15 October. The preferred option is due to be announced in spring 2018 and, if approved, construction work is expected to start in 2020.